If your UNCW Department or Office would like to post on-campus positions or attend recruitment events, you will need to create a Company Page for your office. Please follow the step-by-step instructions below. Select No for the Third Party Recruiter question. Then, click Next: Confirm Email. Next, you will see the following screen, which contains instructions on how to verify your account via the email address you provided. The email should arrive within 10 minutes and will contain a link enabling you to confirm your account. You must click this link before you can proceed with the registration process. If you don't receive a confirmation email, please see our Confirmation Email Troubleshooting Guide. 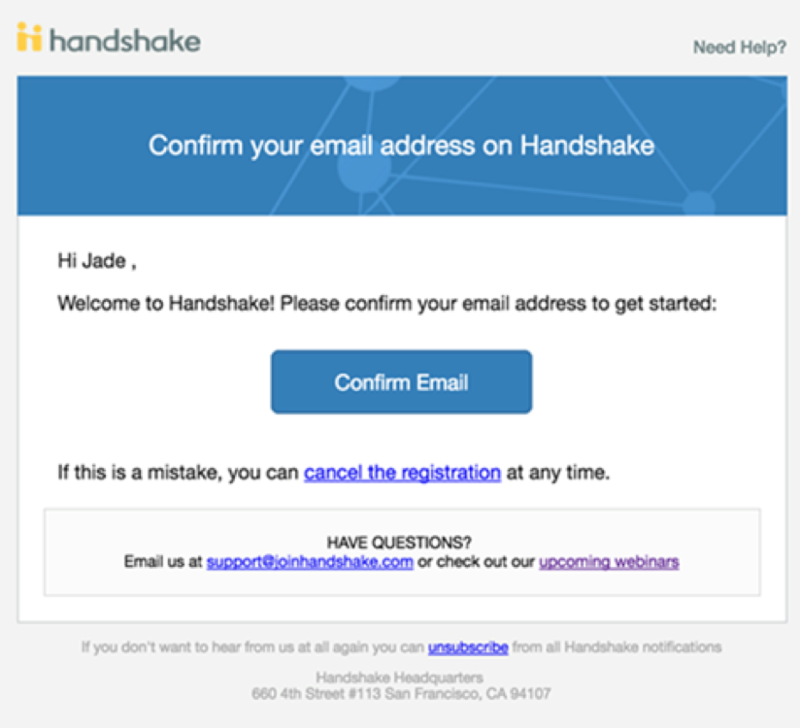 When you click Confirm Email in your confirmation email, you will be brought back to Handshake. You will now need to create a new company page by clicking the button on the right side of the page, “Create New Company” as show below. Do not select another department on campus, you must create a page for your own department. 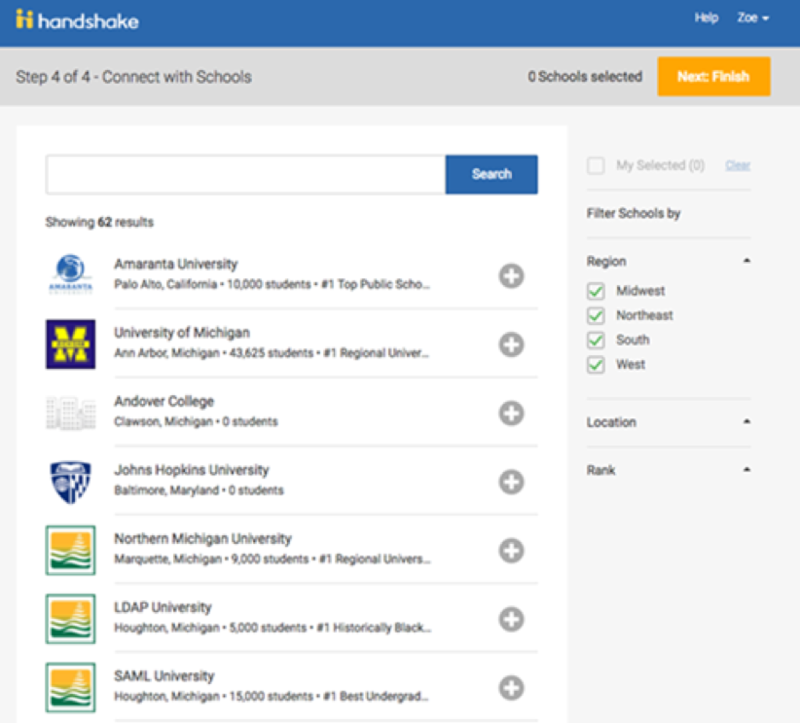 You will then be taken to the Connect with Schools page, and search for University of North Carolina Wilmington, then click the plus sign next to the school. Once you have selected UNCW, click the orange “Next: Finish” on the top right of the page. 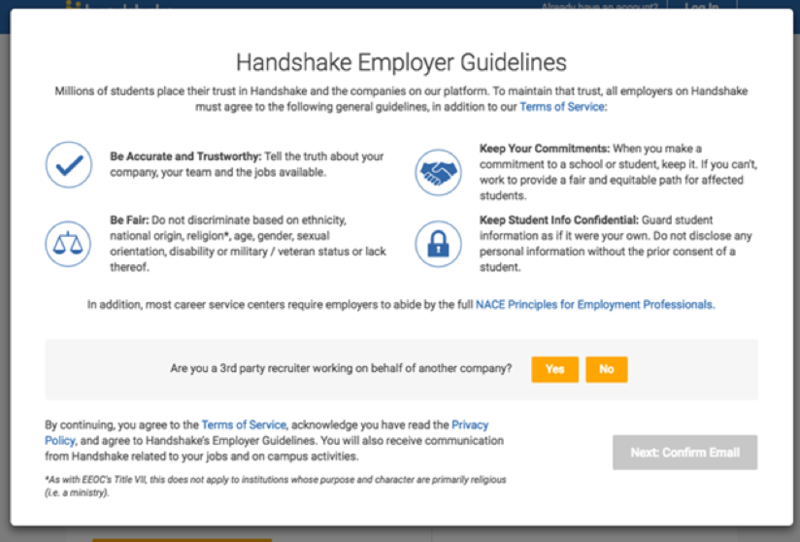 Now your company will need to be approved by our Job & Internship Specialist. Please allow at least 72 hours for your account and company to be approved. 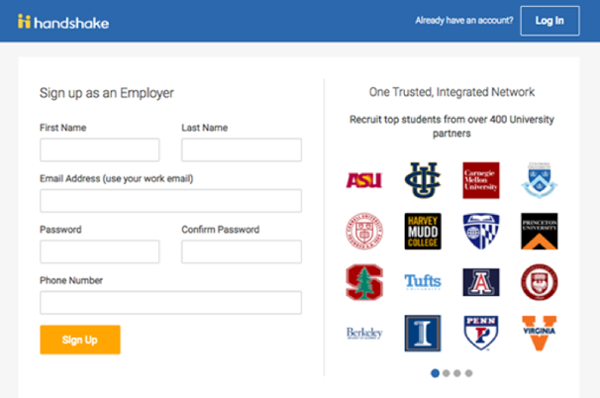 Once your account is approved, you can begin posting jobs, registering for events, and more! 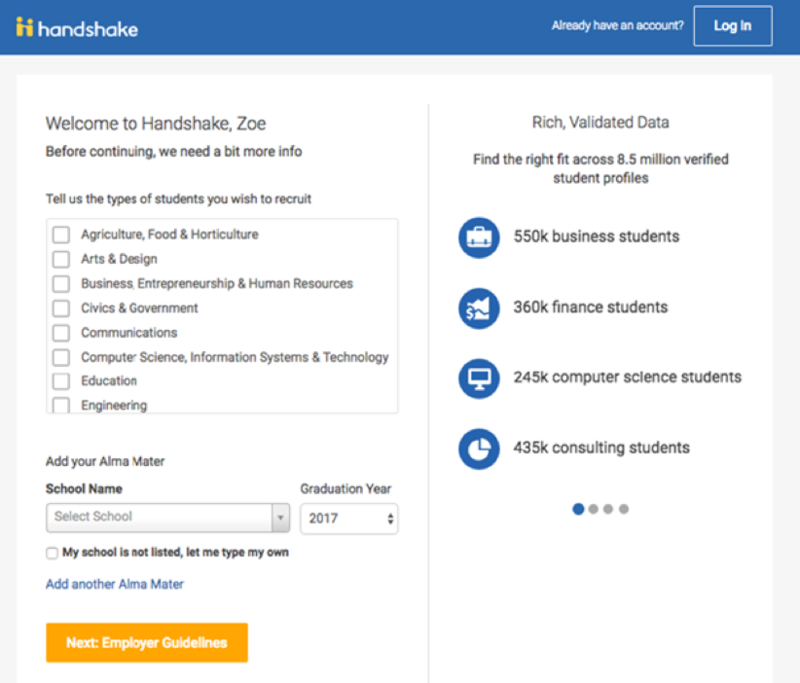 Moving forward, you can access Handshake by logging in at uncw.joinhandshake.com/login with your username and password. You can also go to this help article for more detailed instructions. Please allow at least 72 hours for your User Account and UNCW Department page to be approved. 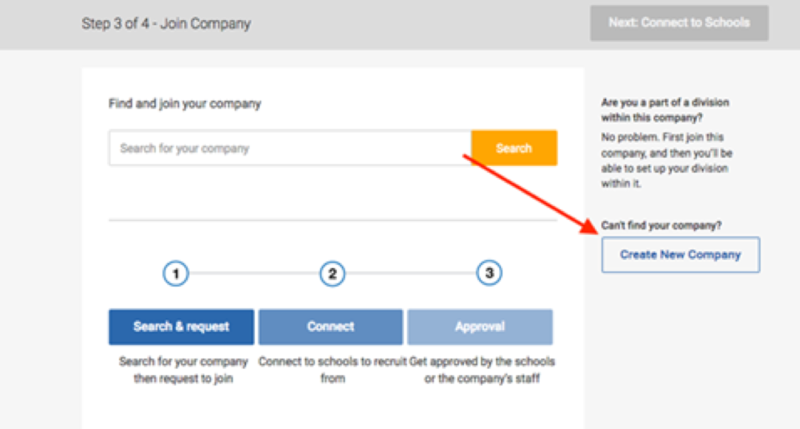 Once your account is approved, you can begin posting jobs, registering for events, and more!